Wandering comfortably between worlds of the abstract and narrative – Canadian artist Niina Chebry selects and dissects her subject matter to keep the viewer engaged and questioning. The suggestion of land, horse, or Asian calligraphy is gestural one moment and methodical the next. There is not one technique she clings to – but the essence of her approach – the juicy layers of texture and translucent colour, creates a sense of mystery to her work.Chebry draws from a wide range of sources for her paintings. She has traveled – collecting inspiration from Asia, Europe and South America. Her childhood spent under vast prairie skies of rural Alberta, she now lives in Vancouver – where the shift to coastal flora and fauna seep into her compositions. 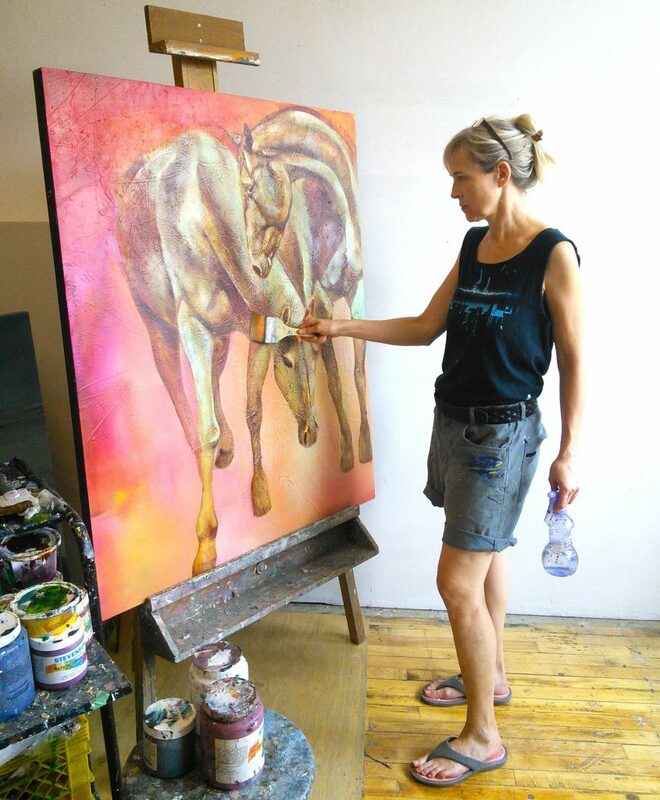 Niina studied fine art at the University of Alberta and received her Bachelor of Education in 1986. As a founding member of Parker Art Salon, Niina is part of a vibrant arts community in East Vancouver where she also instructs art workshops. Her paintings are included in public and private collections in Canada, United States, Europe and Japan, notably at the Ueno Royal Museum of Art and the Canadian Embassy in Tokyo. Niina’s work is currently available with Vancouver Art Gallery, Art Rental Gallery.